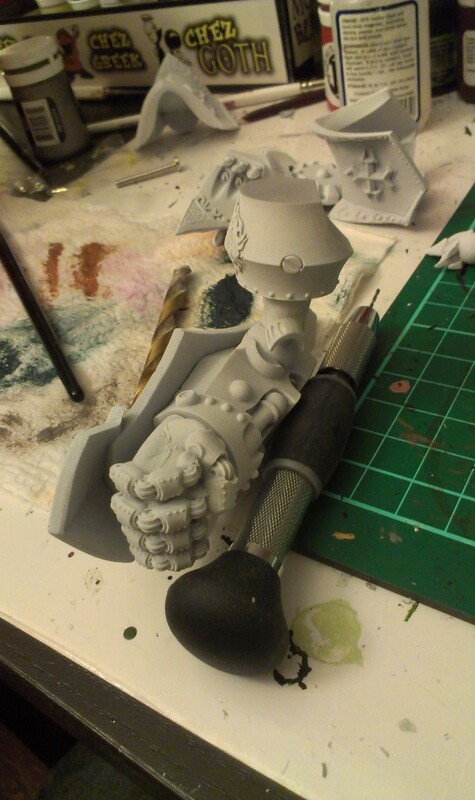 Last week I mentioned that I had started working on my Judicator… well, here she is! Not much to look at yet… I’ve since started priming her (I’ve done… half of the first coat, and I suspect it’ll take 2 coats total, or 3 more priming-expeditions, before she’s got a nice, light, even coat). 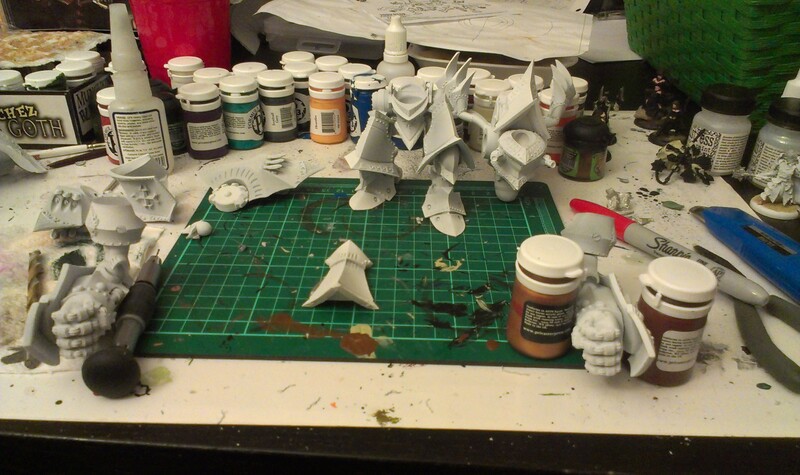 In a bout of insanity, I decided to prime her White… I don’t think I have enough “Menoth White Base” to paint all those surfaces 5 or 6 times if I primed her black, and I’m hoping she’s big enough that I can get my brush wherever I need it! And here’s a picture of her right off before I put on her first half-coat of primer! 1. Wow, is the flash on the Judicator AWFUL. Just, horrible places to put the injection points, and THICK. Took me over an hour to get most of it, and I am by no means a perfectionist when it comes to this stuff. 2. The white metal parts are *heavy*. I’m a little worried that my combination of glue and greenstuff won’t be enough to keep it in place… if she falls apart on me, I may need to pin some of the parts. 3. I’m much more impressed with how she looks already than I expected to be. Don’t get me wrong, she’s no Stormwall (which is a beautiful model)… but she’s not bad. And I like the rocket pods! So… cautiously optimistic? 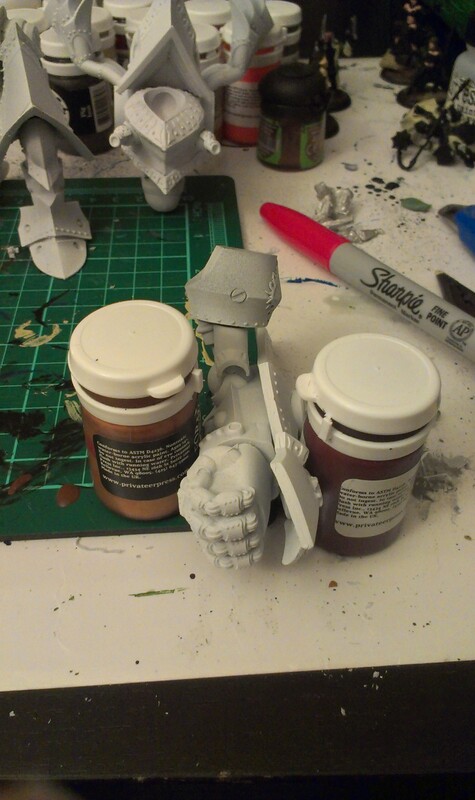 I managed to magnetize the left arm and left shoulder, so that’s done as well… but I may just white-glue the thing together for the tournament. It only has to told together well enough that I can play with it, and then as soon as I get home Saturday night, the whole thing is being broken down into these parts again… so more pictures tonight of how well that works out! So I used my Judicator at the tournament (as everyone who’s listened to the Tournament Podcast on Wednesday will know!). 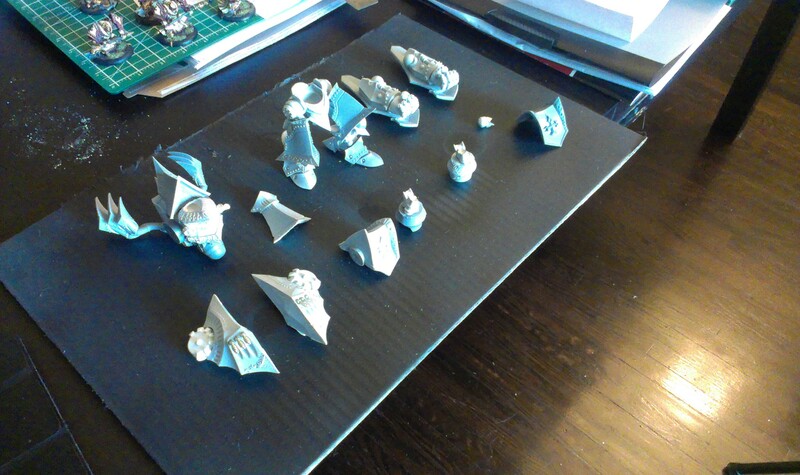 But I didn’t want to permanently assemble the model, since I haven’t painted it yet, and it’s really important that they be in separate pieces so I can paint the white-primed warjack! So what does a guy do? That’s blue-tac to attach it to the base, but other than that, just 2 rubber bands! Boom! 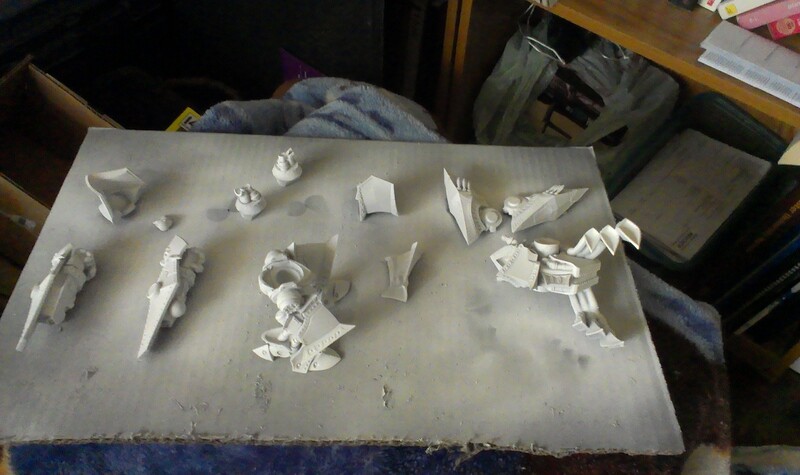 No glue (which is good), and all those pieces are once again ready for painting! I’m hoping to actually start painting this week! 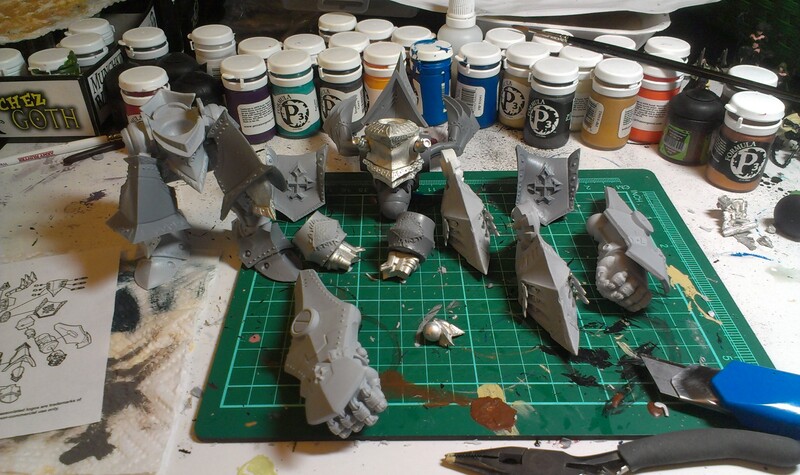 This entry was posted in Menoth, Painting Table and tagged IABN, Judicator, Modelling, painting, Protectorate by Marx. Bookmark the permalink. That picture with the rubber bands attached to it… I feel like it needs a bow 🙂 make her look all pretty, like she’s a present. Tonight she’s getting her metals done (right after we record the podcast!). Can’t wait to see how she turns out!